More than just fan service. Soulcalibur has a history of inserting out-of-universe fighters into its roster. Darth Vader, Yoda, Link and Tekken's Yoshimitsu have featured to varying degrees of success. In Soulcalibur VI Geralt doesn't just fit in, he has one of the most fun movesets in of the lot. Surprisingly, the game even manages to translate the essence of the Witcher's combat style into the Soulcalibur universe. There have to be a few adjustments to slot Geralt into a beat 'em up. He doesn't need to switch between his steel and silver sword to counter humans and monsters. Instead he uses both swords interchangeably, and they do have different purposes in combat. The steel sword is Geralt's go-to, and he strikes with fast, sweeping blows. Geralt saves the silver sword for powered-up strikes and trickier moves, like an attack that turns into a throat-slash when it connects. Silver sword strikes are designed to deal extra damage to soul-charged opponents, punishing enemies when they channel magic. It's a smart interpretation of the rules of the Witcher RPGs—the silver sword does more damage against supernatural enemies. Geralt can roll and spin-dodge sideways, and his combos include the odd pirouette between strikes. Attacks have names like 'Tawny Owl Upsurge' and 'Skelliger Uppercut', and many of them incorporate Geralt's magical signs. You don't really see fireballs in Soulcalibur, but Geralt can burn opponents at range using Igni, which projects a blast of flame from his outstretched palm. He has a fast and explosive Aard blast too. Some special attacks put up a protective Quen barrier as Geralt charges. Granted, Geralt doesn't have to take down hordes of bandits in a beat 'em up, and he doesn't have to kill enormous monsters, but he's a much smoother, deadlier combatant in Soulcalibur than he was in the RPGs—plus he's learned to juggle. I also love that Geralt activates his powered up soul charge state by slamming a potion. In this state he gains access to fast, fluid combos that look almost exactly like some of most twirly and fancy strikes from the RPGs. There's one combo he can keep up indefinitely until the effects of the potion have worn off, and he can cast multiple spells in his frenzied state. He transforms from being a flexible mid-range swordsman with good counters to a high pressure offensive powerhouse. Geralt has his own singleplayer campaign, like everyone else on the roster. His story is told in basic still portraits between battles, but the dialogue is voiced by Doug Cockle and the lines are true to character, even though it is just an excuse to loosely tie together some basic battles. Geralt even makes reference to his pendant going off as he marches into fights, and he has his own stage—the mountain fortress of Kaer Morhen. Crossover tie-ins can feel cheap, and a half-arsed version of Geralt would have been sad. 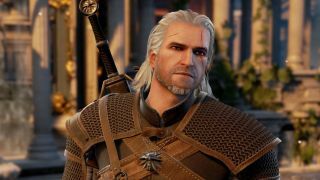 Project Soul has done a great job of bringing our favourite RPG hero into the game, with a strong degree of respect for the Witcher universe. We'll have a more detailed verdict on Soulcalibur 6 once the servers are live and I've tested the game online (spoilers: it's pretty good so far), but for now let's enjoy our man unleashing his super on Siegfried. Take that!